For years U.S. leaders have repeatedly “warned” North Korea to end its development of nuclear weapons and the intercontinental ballistic missiles with which to deliver them. Successive North Korean dictators have ignored those warnings. Not only has the country’s current leader, Kim Jong-un, refused to heed warnings by President Obama and President Donald J. Trump, he’s actually sped up development of his ballistic missiles and his nuclear infrastructure. However, unlike Obama, Trump appears to mean business when he warns of grave consequences should Pyongyang continue to ignore his warnings. Now, the situation may have progressed to the point of a full-blown crisis. Over the weekend North Korea conducted yet another ballistic missile test, but this missile traveled much farther than previous designs and is believed by U.S. intelligence to be capable of reaching Alaska. 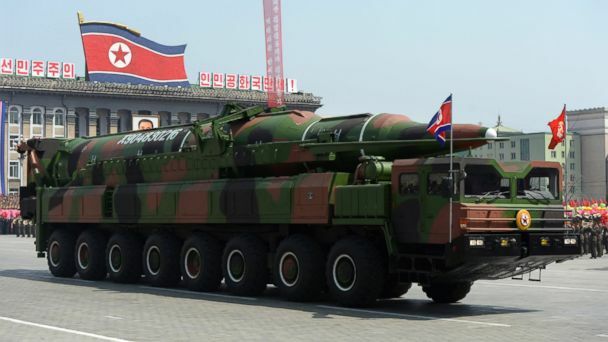 If true, that means for the first time, U.S. soil is within reach of North Korean missiles; eventually, when the North perfects the miniaturization process of placing a nuclear device atop those missiles, it will possess the ability to strike America with nuclear missiles. In an interview with the Independent Review Journal, Tillerson added: “We’re not sure if we can get ahead of them. If they just continue, you know, we’re headed to a place no one wants to be… if they continue with their testing and continue the development of both their weapons and their delivery systems, then we’re going to find ourselves in a place that’s even more dangerous than we are today.” During the interview, he used the word “imminent” at least four times. That’s a war warning, pure and simple. And this weekend, following the North’s more recent ‘in-your-face’ test, the president is moving. As reported by Voice of America, Trump held phone calls with the leaders of Japan and China; presumably, the leader of South Korea will either be contacted or has already been contacted about U.S. intentions should the situation escalate to a point where it is now. While the U.S. really only needs the permission of South Korea to launch military strikes against the North, it would be helpful to get at least tacit approval from Japan and especially China, the North’s principal benefactor. China, however, is key to all of this: It is the only country with any hope of pressuring Kim to drop his nuclear weapons development, and that’s only if Beijing wants to exert that kind of pressure. If China can’t or won’t, it’s likely Trump will make good on his promise to end the threat with the use of massive U.S. firepower. That means U.S. electronic infrastructure ranging from our electric grid to banking systems to air traffic control, water purification and regulating dam flows, among many other things, will be targeted and much of it likely compromised. Or destroyed outright. Preppers be forewarned: Check and double-check your gear, weapons and other equipment. If you’ve not yet purchased portable solar panels to help power some of your electronics, now would be a good time to do that. If U.S. infrastructure suffers a major hit by North Korea, the ensuing societal chaos will be monumental. And North Korea would want exactly that to happen.